Note that Unit 26 (in Row 27), and several others, have status = Empty, and therefore are colored yellow. I have another sheet that is formatted to look like the floor plan of the building. 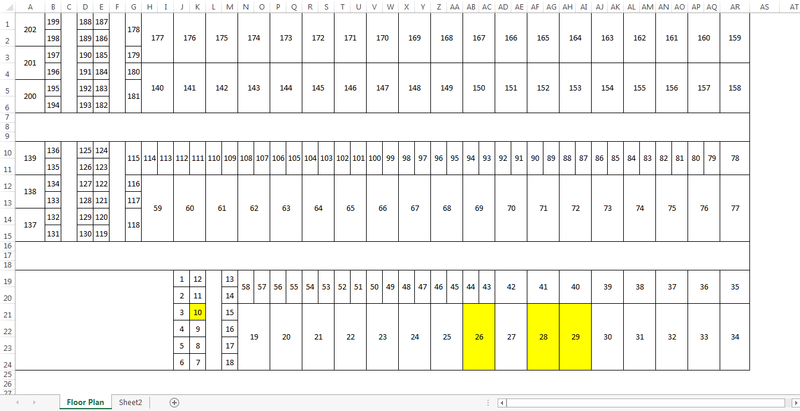 It has merged cells (because the storage units are not all the same size) which contain the unit numbers (corresponding to the Unit # in Column A in Sheet2). I want to color the units in the floor plan based on the status information. For example, since unit 26 is empty, I want it to be colored yellow. How can I do that? 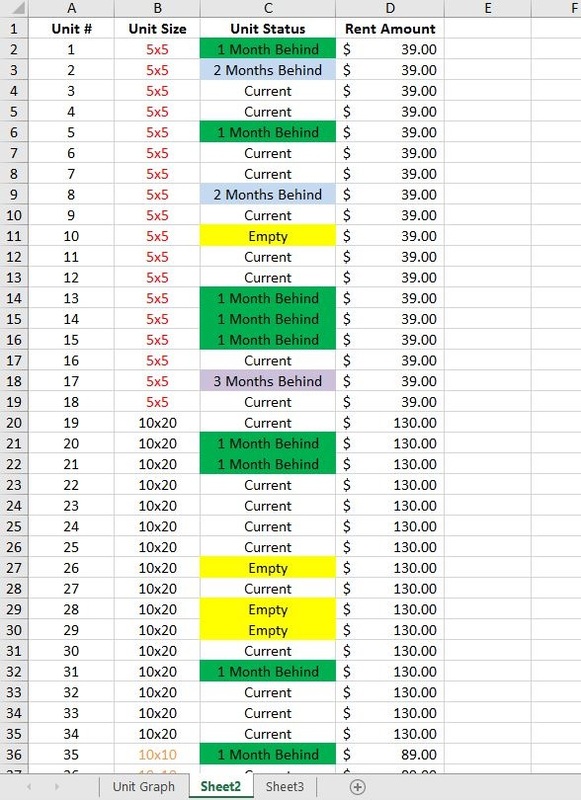 =VLOOKUP(A1, Sheet2!$A$1:$D$203, 3) = "Empty"
where $A$1:$AR$24 is the range of the floor plan. I did the above in Microsoft Excel 2013. 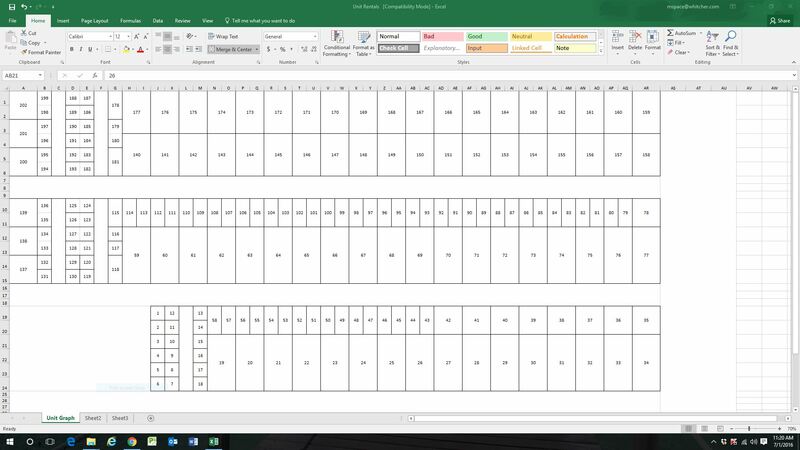 I vaguely recall that older versions of Excel didn’t allow conditional formatting formulas to access data on another worksheet. 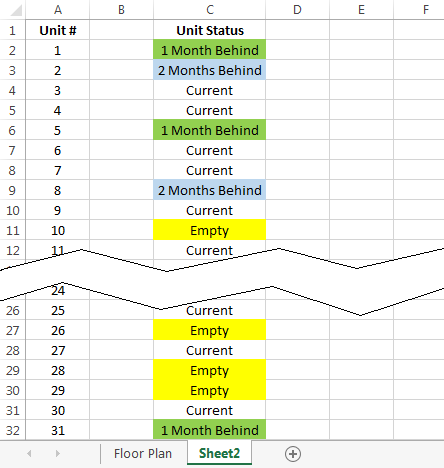 If you have that problem, just dynamically link your status information from Sheet2 onto the “Unit Graph” (floor plan) worksheet (e.g., in rows 101-303), and go from there. I thought it was tougher than this, but it turns out to be quite simple. 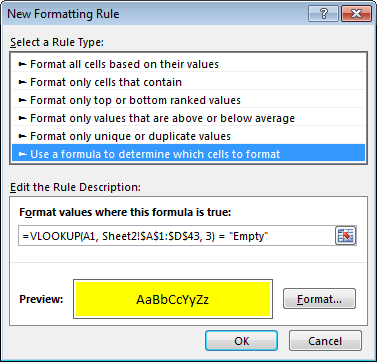 Create a new field, a new column in Sheet2. Name it Map, which relates to your Graph Sheet. Your first entry will be a formula for unit 1. One by one. Start with Unit 1. 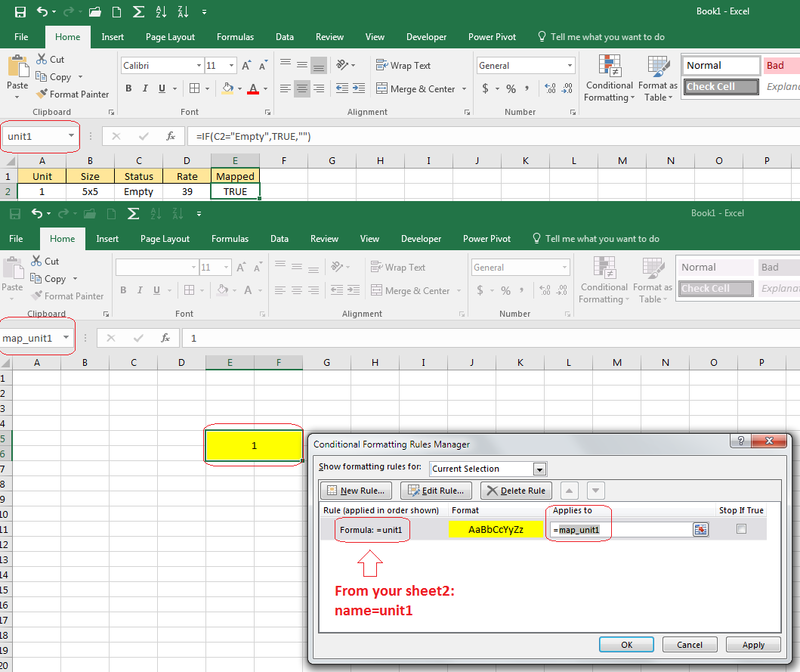 Select Unit one's cell, or cells, then add a conditional format according to your Sheet2. 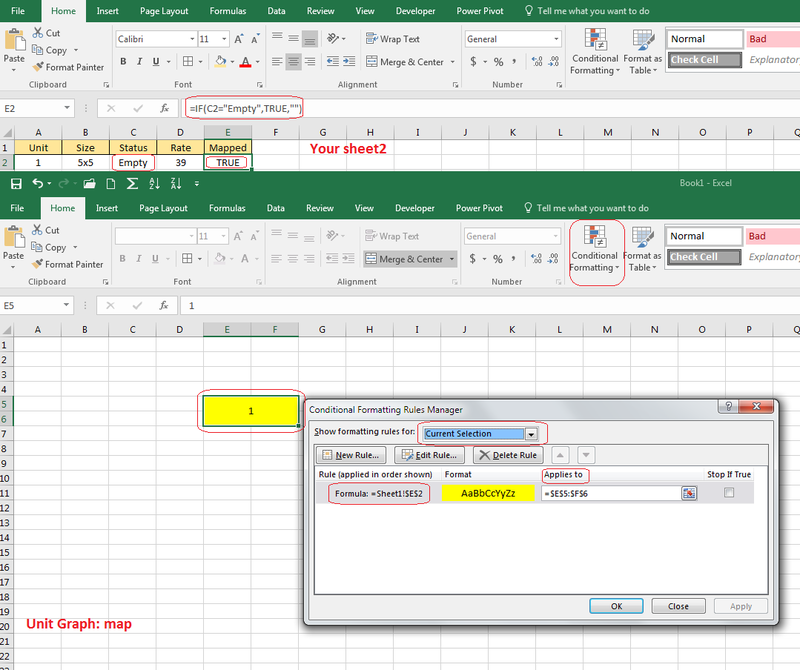 When the field "Map" is true, your conditional formatting on GraphSheet will render. My cells and sheets may have different names than yours. 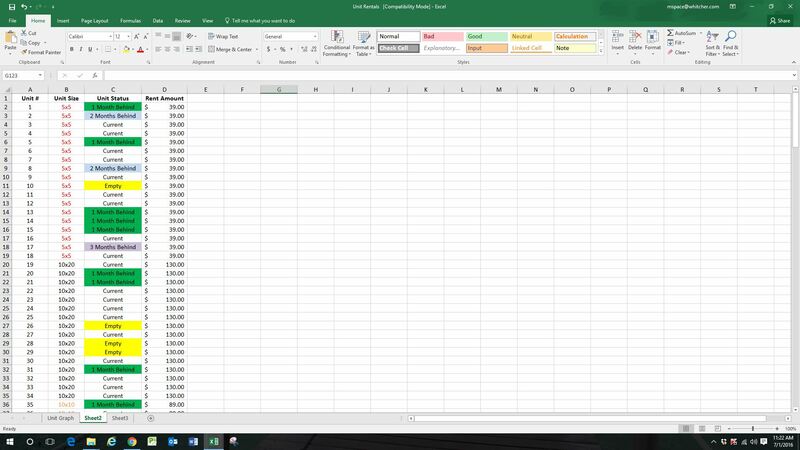 Can you make Excel Change Another Cell's Colour When This Cell is Clicked?